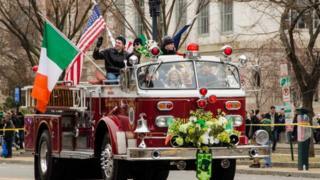 The annual St Patrick's Day Parade in Washington DC has been cancelled for 2019, with the organisers citing high security costs. The St Patrick's Parade Committee of Washington DC said it was "distraught" to announce the cancellation. The committee is an all-volunteer, non-profit organisation. It said it would continue to raise funds so it could hold a parade in 2020 - the 50th anniversary of the first St Patrick's Day parade in the city. The committee said the costs of preventive security measures increased sharply after a 2016 truck attack at a fireworks display in Nice, France, in which 86 people were killed. "After the 2016 tragedy in Nice, France, the government of the District of Columbia has significantly increased preventative security requirements for public gatherings such as the St Patrick's Parade," the committee said. "The corresponding rapid increase in overhead, in combination with relatively stagnant funding, have put the committee in a precarious financial position." The committee said some expenses are off-set by a grant from the government of the District of Columbia. However, it said as costs have increased, "recently the grant has not had the same effect in reducing our financial burden". "This reality and the committee's steadfast commitment to holding the St Patrick's Parade of Washington, DC in 2020, its 50th year, have led us to the very difficult, but necessary, decision to cancel the 2019 St Patrick's Parade," it said. The committee said that St Patrick's parades would still take place in nearby Baltimore and Annapolis in 2019.